2015 Champagne Tasting - Cooking With C.C. 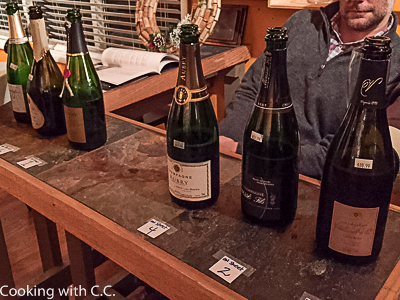 Tuesday night was the annual Grower Champagne Tasting at The Wine Celllar. The line up this year included a number of champagnes along with some other sparkling wines from other parts of the Europe. In order for a sparkling wine to be Champagne, it has grown and made in the Champagne region of France (Around Reims) using the Méthode Champenoise. This method of making Champagne, uses a primary fermentation usually in tanks. A second fermentation occurs in the bottle which creates the legendary bubbles. Over the last number of years, the popularity of “Grower Champagnes” has increased. A Grower Champagne is where the person who grows the grapes also makes the Champagne as opposed to a large Champagne House such as Krug or Veuve Clicquot. There were 10 wines in the tasting including 6 grower champagnes. There were three that were my favorites. The first one was also my favorite from last year: Mousse Fils “Cuvee Noire Reserve” Brut and the A. Margaine Demi Sec. The Mousse Fils is 90% Meunier and 10% Pinot Noir. The retail on this one is $51.99. The difference between a Brut and a Demi Sec is the level of sugar remaining in the wine. This wine was not a sweet wine, but was very tasty. The blend is 92% Chardonnay and 8% Pinot Noir. The tasting notes say that it “flows with generous white peaches, sweet spices and flowers as well as a rich, textured personality that is impossible not to admire.” All I know is we really enjoyed it. The retail for this wine is $51.99. Our next favorite was of course the most expensive wine of the night – the Vilmar & Cie “Cuvee Rubis.” The blend on this wine is 90% Pinot Noir and 10% Chardonnay and it is a rose champagne. The notes include “flavors of black currant, biscuit, candied lemon zest and smoke with a clean-cut chalky finish.” Retail on this wine is $80.99. Jean Milan Blanc de Blancs “Grand Reserve 1864” Brut at $72.99. This is 100% Chardonnay. L. Aubry Fils Brut at $41.99 with about 45% Pinot Meunier, 25% Chardonnay, 25% Pinot Noir and traces of Arbanne, Fromenteau and Meslier. 2010 Philippe Fontaine “Cuvee des Lys” at $59.99. This is the only vintage champagne in the line up. This one is 100% Pinot Blanc. So, we’ve tasted 6 champagnes that are all very different and all very good in their own way. Any of these would be great wines to celebrate the Holidays. The next 4 wines were from different areas in Europe including one from France. The Bailly Lapierre Cremant de Bourgogne Pinot Noir is made in the Champenoise method from the Burgundy wine region. This one was very similar to the Champagnes in the line up but at $25.99 a less expensive French Sparkler. Next we moved to Germany tasting the 2014 Leitz Dragonstone Riesling Sekt. This is a 100% Reisling sparkling wine and to me was a very “steely” wine being very dry. At $20.99 it is a good value if you want to try something different. Off to Italy with the 2014 Col Veteran Prosecco. The price on this wine is $20.99 and is an excellent example of a nice Prosecco. This brings us to the last wine of the tasting and to be honest, I didn’t like it at all. It is the 2011 Raventos i Blanc “L’Hereu” Brut Cava from the Penedes region of Spain. I’ve had the opportunity to visit this area and visited a very large Cava house. I have several Cava’s that I do enjoy – this isn’t one of them. This wine had a very mineraly taste to it. Several of the folks at the tasting really enjoyed it, so if you like your wines a little on the “funky” side, then you might like this one. As I’ve stated before, the best way to learn what you like and what you don’t like is tasting a wide variety of wines. There are always some I like and some I don’t – but that’s what makes the wine world go around. Take advantage of the opportunities to taste and learn.